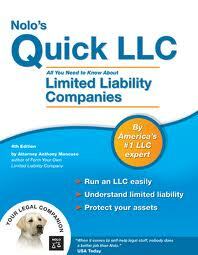 If you run your own business, you’ve probably heard about limited liability companies. Business owners who operate LLCs aren’t personally liable for business debts, so their personal assets are never at risk. But is forming an LLC right for you? Practical, concise and easy to read, the 6th edition of Nolo's Quick LLC provides the latest facts, figures and updated tax information you'll need to know about this structure for your small business. The course work was comprehensive. The test was quick and easy. received my grade the same day. Great cpe course.